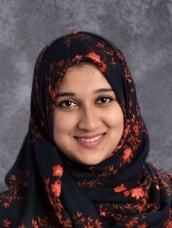 Muzna Khan is licensed in School Counseling (PreK-12) by the Commonwealth of Virginia. She holds a Masters in Counseling and Development (M.Ed.) from George Mason University, as well as a Bachelors in Education from the University of Houston. Ms. Muzna served as one of the founders of the AFA Wellness Program and worked to establish the counseling program at Al Fatih Academy. She is a member of the American School Counseling Association and the Virginia School Counseling Association. As part of her counseling training she worked at Loudoun County Public Schools (LCPS) in various elementary and middle school programs. During her field work, she provided research based interventions to students with anxiety, grief, changing families, and special needs. She has also worked with students in the areas of conflict resolution, coping skills, anti-bullying, and mindfulness. Prior to establishing the counseling program at AFA she previously served at AFA as a second grade classroom teacher for three years.